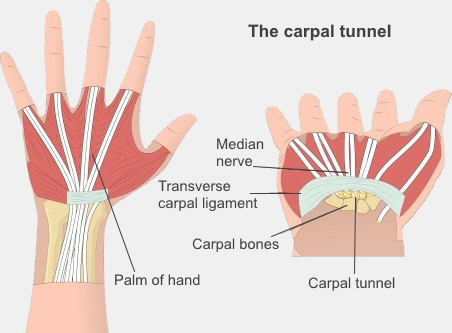 The carpal tunnel is a narrow passage in your wrist, through which your median nerve and the tendons to your thumb and fingers pass. If you have carpal tunnel syndrome, your median nerve is compressed (squashed) because there is pressure on it. This causes symptoms like numbness or tingling in your thumb and fingers (but not normally your little finger), or the palm of your hand. You may have pain in your wrist, which can shoot into your fingers, or sometimes up to your elbow. Your muscles might be weak, especially if you have to grip something. Your symptoms may be particularly bad at night, or when doing the same task for a long time, like long-distance driving. Carpal tunnel syndrome is quite common. We don't always know, exactly. Anything that causes swelling in the carpal tunnel can cause it. It can happen if your tendons become inflamed, putting pressure on your median nerve. It can happen in one or both wrists. It is more common in women. wrist wounds or broken bones. Carpal tunnel syndrome can sometimes happen after forceful or repetitive movements of your wrist or hand. Sometimes, when it has been caused by the tasks you do at work, ACC may cover carpal tunnel syndrome, so talk to your doctor about this. Your GP will talk to you and will examine your hand and wrist for nerve damage. Specialists sometimes test how your median nerve is working by using what are called nerve conduction studies. They measure how well and how quickly your nerves conduct electrical signals. This can help if it's not obvious that you have carpal tunnel syndrome. However you can only get this test through the public health system if a specialist recommends it.